See – Hit B16 Black with red center 25 yard slow fire pistol target. By using other colors of bull’s eye, it allows you to see the bullet holes more readily. (12 per package) Drawn to NRA B-16 spec, See-Hit® B-16 RC target is designed to make every shot visible from downrange. All hits on the target leave a fluorescent green ring around the bullet hole. 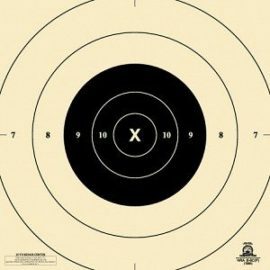 See – Hit B16 Pistol target for 25 yards slow fire. 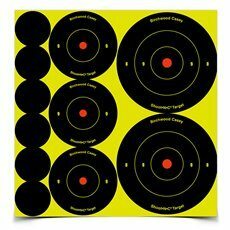 (black with red center) (12 per package) NRA 25 yard slow fire pistol target. 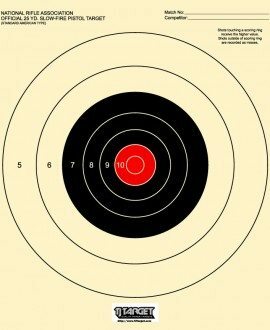 The red center helps the shooter to focus, “aim small, hit small”. Dim 10″ x 10″. Drawn to NRA B-16 spec, See-Hit® B-16 RC target is designed to make every shot visible from downrange. All hits on the target leave a fluorescent green ring around the bullet hole.